I went through rhinoplasty yesterday. This is the first time I’ve been able to write anything. I was unconscious for the procedure itself, and I needed my boyfriend to bring me home afterward. I’ve been pretty out of it. Rhinoplasty is serious surgery. My nose is badly swollen. I have to fight the urge to touch it. Fortunately, I have some painkillers my surgeon recommended. I’m also taking antibiotics, just in case. I’m more or less living off fluids at this point. The swelling hasn’t gotten any worse. I think the pillow might be helping. I can’t wait to see what my rhinoplasty looks like when I’m done. I managed to eat something today. It was instant mashed potatoes, but that’s something. 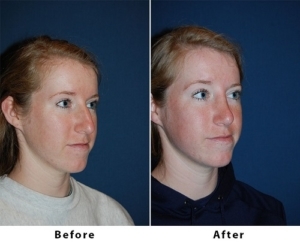 Dr. Sean Freeman is the best nose job surgeon in Charlotte. He’s been certified by two different surgery boards, the American Board of Otolaryngology (head and neck surgery) and the American Board of Facial Plastic and Reconstructive Surgery. He has devoted himself to facial plastic surgery, including nose jobs, since 1988. Many of his patients have already gotten nose jobs from other surgeons and come to him for revision rhinoplasty to get the results they really wanted. If you live in or near Charlotte NC and want a nose job, improve your chances of success by making an appointment or scheduling an online consultation with the best nose job surgeon in the area today.